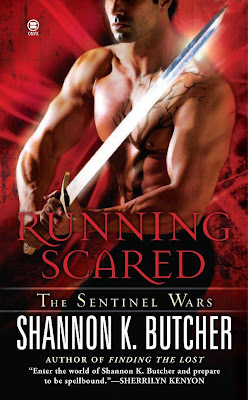 The cover art is out for Running Scared the third book in Shannon K. Butcher's Sentinel Wars series (yes that Butcher). Other books in this paranormal romance series include Burning Alive (May 2009) and next month's Finding the Lost (Nov. 3). Running Scared releases May 2010. Sheila interesting how so many of the paranormals are moving to males on the covers with lots of swords. It's only fair! How many years of fantasy/science fiction covers did we have with cleavage and spike-heeled boots? Who is the main character in Running Scared? Joanna I'm good with equal time on covers. Nothing wrong with some eye candy for the ladies. Audrey sorry but I've yet to read this one. Maybe Shannon's site can shed some lite. Running Scared will be Zack and Lexi's story, started way back in the first book. Thanks for the update Kaleigha!